When it comes to visual aids God is no slouch. Knowing us like He does means that He also knows how to get a message across in a 3D visualisation. One of the best of these is the Tabernacle. Well if it is a copy of the true then the true must be like it, right? So to look at the tabernacle is to look at a copy of heaven, the real thing. 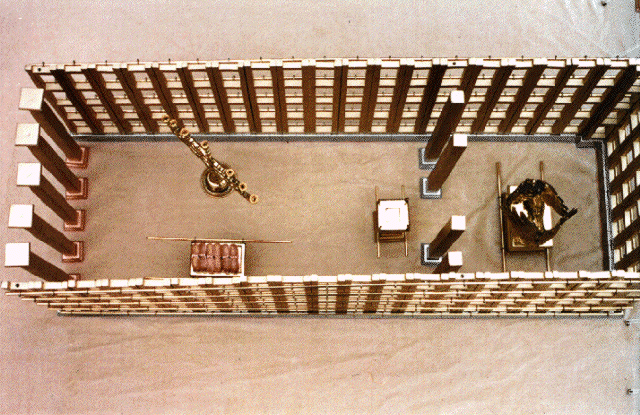 These – and others like Ezekiel – all saw the same place and recorded various elements of it. Some described things Moses wasn’t told to represent, e.g. the four living creatures. Others saw the same things but described them differently. So here is a question: What was God’s original purpose for the Jewish people? Here’s a hint: it’s the same purpose He has for the Church today. The answer is in Exodus 19:6 and 1 Peter 2:9. Jesus is central to the whole thing. Our eternal High Priest He took His own blood into the true tabernacle which is not of this creation. Hebrews 9 gives the details. Daniel also hints at what happened when he saw “One like the Son of Man” present Himself to the Ancient of Days in Daniel 7:13-14. And because Jesus has gone into heaven so can we. In fact we can enter the Holy of Holies because Jesus has removed the veil that was in front of the Father’s presence. Apart from being a copy of heaven, which is amazing in itself, the tabernacle has many other things to teach us. I’m going to choose two fundamental ones: 1. Becoming a Christian, 2. The main practices of the Christian Life. So what are the stages to becoming a Christian? 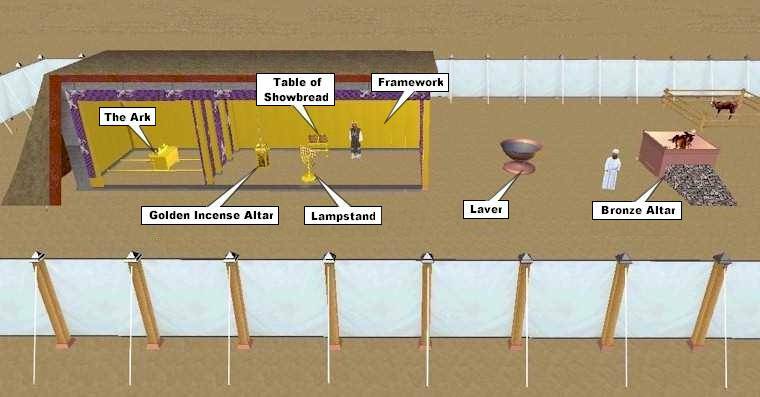 You need to enter through the narrow gate at the front of the tabernacle (Matt 7:13-14). There is a picture here of passing from one dimension to another since it is through this narrow door that we enter into (the copy of) heaven (John 10:7). Jesus also called it being born again (John 3:5). Birth is a picture of passing from one place where we breathe and ingest one type of substance (water) to a place where we breathe and ingest quite another (air). Then the Cross (the big bronze altar) is the first thing you see (Hebrews 10:10-14, 1 Cor. 15:1-4, Isaiah 53). It’s also the thing God sees. That altar is too big for us to sacrifice on, there was only one offering good enough and Jesus supplied that with His own body once for all. Baptism (in the Spirit and in water) is represented by the bronze laver or sea. The first time a priest entered the holy place he had to be completely washed (Exodus 40:12, c.f. Romans 6:3-7). After that he only needed to wash his hands and feet before he went in (c.f. John 13:10). Water baptism is our response to the gospel, the testimony of a conscience cleared (1 Peter 3:21). Spirit baptism is a work of God. 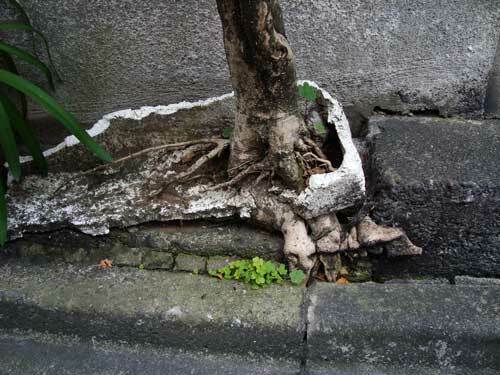 Some people say it is a second experience after being born again, some say it is the same as being born again. Personally I think the Scriptures point to the second interpretation. Whatever you believe about it just make sure you have it! Now the way is clear to enter the Holy Place and start practicing the Christian life. 2. The Practices of a Christian. I believe these three items represent three practices, which if followed diligently will ensure we continue to be a blessing to the God who loved us and our fellow man (Matt. 22:37-40). 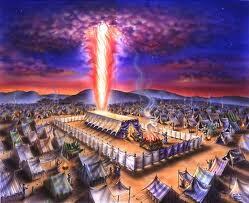 In heaven (of which Moses’ tabernacle was a copy remember) according to Revelation 1:20 the lampstand(s) is the Church. In particular Jesus walked in the midst of the seven lampstands (local churches) in the New Testament whereas the Old Testament lampstand was just one object. A lampstand is a place to present a light or, in the case of a New Testament church, the place to present the Light of the World (John 8:12). It was the job of the priests to ensure that the lamp never went out. In the New Testament this speaks to us about our role as priests to ensure we do not quench the Spirit (1 Thess. 5:19) and to ensure the light is shining forth to the world around (Matt. 5:14-16) not hidden under a basket. So the first practice is to be an active part of a local church. In heaven, according to Revelation 5:8, there was an altar upon which the prayers of the saints rose up before the throne of God. 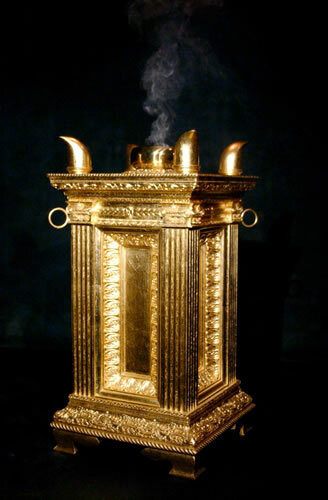 This is represented in Moses’ tabernacle by the altar of incense. An altar is a place of sacrifice. This altar is much smaller than the one outside the Holy Place but it is solid gold and speaks of the sacrifices Christians are called upon to make. These sacrifices have to originate from relationship with God in prayer and through prayer be continued. So the second practice is to pray and sacrificially act upon the prayers. 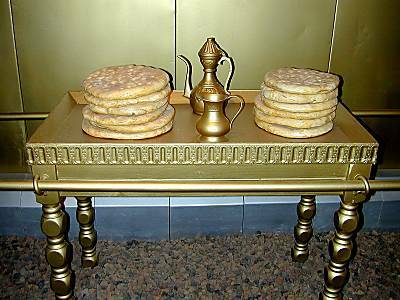 When making the copy of heaven, Moses was commanded to make a table upon which was to be placed fresh bread every day. Jesus said that “Man shall not live by bread alone but by every word that proceeds from the mouth of God” (Luke 4:4) and there are many references to bread and grain being the word (e.g. Matthew 13, John 6:48 and others). Bread is refined, milled and ground grain with the chaff removed. This is rather like the bible but more especially like the word(s) of God spoken to us through fellowship with Jesus. So the third practice is to spend time with Jesus and to hear His words (Luke 10:38-42). Well one place only really – the throne of God. Thanks be to Jesus the veil that used to separate us from God is removed (Hebrews 10:19-22) and we can enter the presence of the Most High without fear as children coming to a loving father.